The average American will consume about 4,500 calories on Thanksgiving Day when the pre-meal party, the actual dinner and dessert, then evening leftovers are all taken into account. That is enough to gain a pound or two, which can be remedied, but how many more days like this will there be? Actually, there is the potential for quite a few as the holidays approach: Thanksgiving weekend, family holiday parties, work holiday parties, neighborhood/church holiday parties, Christmas Eve, Christmas Day, Christmas week, New Year’s Eve and New Year’s Day. In addition to extra meals and calories is the fact that activity levels generally taper off during the holidays. The combination of overeating and not much exercise has the potential to provide weight gain that is often not lost, and year after year, a few more pounds continue to be added to the tally. It is possible to get through the holidays, however, without gaining weight and being mad at yourself in January. 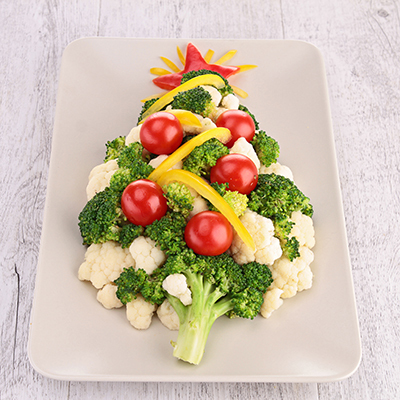 Consider these 10 tips for healthy holiday eating. Eat what you love and leave what you like. You don’t have to eat everything that is put in front of you. Make careful choices and stick with the foods you enjoy most. Don’t select foods that aren’t your favorite just because they are there. Go to gatherings to gather, not to eat. Focus on enjoying those you are with, not the food. Fill your plate with 80 percent healthy foods, and save the other 20 percent for dessert or treats. Skip the punch and eat the cake. You’ll likely enjoy eating your calories more than drinking them. Don’t save up for later. It doesn’t make sense to starve all day because you have a party that night. You will likely end up consuming more because you are so hungry. Eat light, but don’t skip meals. And especially, don’t skip breakfast. It is the most important meal since it fuels your body as you start the day. Pack the snacks. Keep healthy snack choices available when you’re on the run so you don’t overeat at mealtimes. Follow the three-bite rule. People seem to most enjoy the first and last bites of what they eat, so put a bite in between and call it good after three. Don’t skimp on sleep. Being tired and cranky won’t be good for anyone during the holidays. Drink water. Staying hydrated during the hustle and bustle will help you feel your best and will also help you not feel so hungry when you get to the table.